I make Christmas cards for a local cancer charity - TENOVUS - This began in Cardiff about 40 odd years ago, perhaps it may be 50 odd years now... Anyway a group of business men got together to do something in memory of a friend who had died of cancer. They wanted to raise money, a lot of money for research to be done locally for local people. They worked out the plan and then had to decide on a name for the charity. One of them said "There are ten of us, why not call it that?" and TENOVUS was born. I am given loads of old Christmas cards for recycling and I cut them up and make tags or matt and layer bits to make new cards and these I sell to raise money for them. 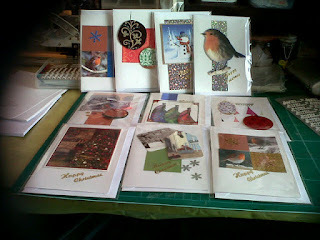 I also give a pile of cards to the TENOVUS shop so they can sell them too. I cover the cost of the card blanks and the glue and embellishments by using some of the old cards I am given to make some of my own cards. I love doing it even though I don't like making cards - I know, I am odd like that. There should be a picture but I took it with my phone and I haven't yet worked out how to get it from the phone to here. I can't put the phone software onto my computer because the computer won't accept it and just stops working. I will have to email the picture to me and then save it and then upload it - sigh. Done that now!! !